Can you guess which OLLI instructor lived on a Wildlife Refuge, graduated from the University of North Carolina at Greensboro and has lived her life sublimely aware of the delicate symbiotic relationship between humans and the natural world? Dot was born and raised in Leesburg, Virginia. Her mother was a lapidary and jeweler instilling in her the seed of creativity and its relationship with nature. She graduated from UNCG with a degree in Biology in 1967. From 1967 to 1973 Dot, her husband and daughter lived and worked on the E. S. George Reserve of the University of Michigan near Pinckney, MI. It was in her words an isolated life, living one with nature, communing with the flora and fauna of the Michigan landscape. The refuge habitat includes numerous wetlands, ponds and hardwood forests. Researchers affiliated with the university study everything from whitetail deer behavior and dynamics to Ambystoma (a salamander like wood frog) and Asclepias (milkweed). Research papers, Masters theses, and Doctoral dissertations, all carried out since 1930, have been published documenting the flora and fauna of the ESGR. In those seven years Dot experimented with her artistic abilities, theorem painting on velvet, which she sold to supplement the family’s income. Dot explained that theorem painting was popular in the early 19th century, taught mostly to young women in finishing schools; an early colonial craft that has lost its favor over the years. 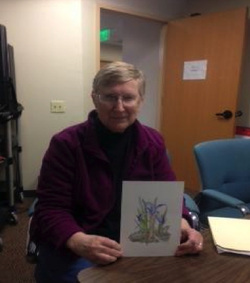 Dot attributes some of her passion and inspiration for her art to a woman by the name of Ruth Brunstetter, a botanical illustrator who was featured in an exhibit at the Botanical Gardens in 1978. Dot took lessons from Ruth and discovered her talent with watercolor and the art of botanical plates. Originally, herbalists wanting to educate people who couldn’t read created the illustrated plates. Monks living in monasteries sketched on vellum a visual record of the diagnostic characteristics of a plant and how to use it for medicinal purpose. Their sketches were done with all natural pigments from the plants growing in the forests nearby. Records go back to the 13th century. By the 18th century, pre-photography, the botanical plates were for recording newly discovered plants by adventurers, explorers, and botanists. Today the art form continues bringing pleasure and beauty, another technique, one of many ways to represent plants in art. Dot has been graciously sharing her passion and artistic techniques with the students at OLLI since 2005. She loves what she does, fascinated and intrigued by the various interpretations her students bring to the same instruction. “It’s fun and I enjoy teaching students how to slow down, look and listen to things in nature. It’s in the details.” And OLLI? “OLLI keeps people thinking, doing, and enjoying life.” Well said, Dot!